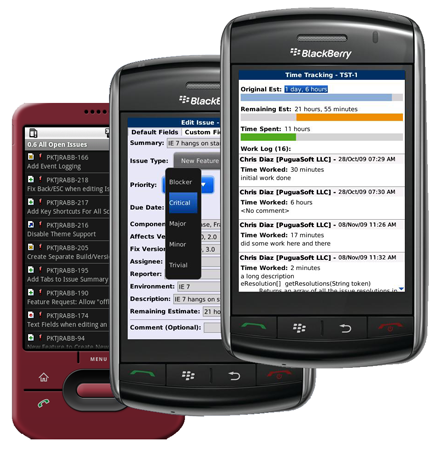 PocketJIRA - JIRA application for the BlackBerry, Android and other mobile devices. PocketJIRA Lite for Android is now available in the Android Market. PocketJIRA Pro for BlackBerry version 0.6.0.713 is now available! Visit the downloads page for more info. PocketJIRA is an application that lets you easily access JIRA issues on your mobile device including the BlackBerry and Android. With PocketJIRA, you will be able to view, and update JIRA issues, comments, follow workflows, and more from the palm of your hand. PocketJIRA currently supports JIRA server versions 3.13.x and 4.x. Support for the older JIRA server versions 3.11.x and 3.12.x are planned for a future release. We are currently developing PocketJIRA for the BlackBerry and Android devices with a versions for other devices planned for the future. PocketJIRA is deveopled by PuguaSoft LLC. PocketJIRA and PuguaSoft LLC are not affiliated with Atlassian. All registered trademarks and logos belong to their respective owners.